To some, owning firearms is a necessity. Having a proper place to store them is definitely a necessity. Depending on where you live it might be a legal requirement. The Homak HS40221120, 12-Gun Safe will have you covered in this department. We will look into the pro’s and con’s of this gun safe, and decide whether or not you should spend on your money. The Hunter Green exterior is a hit amongst hunters. 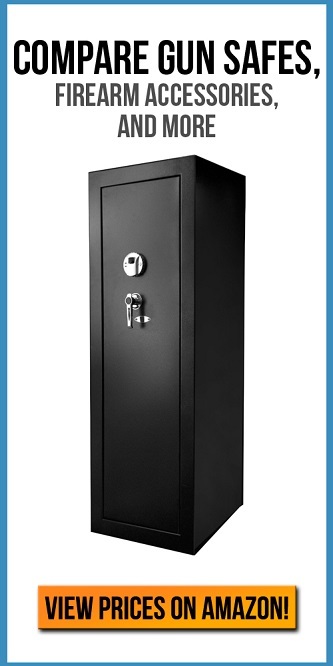 It is a different look from your traditional black or grey safes. The green is nicely offset by the brass handle and lock. What made the size so appealing for us is the slimmer build. Meaning if you have limited closet space, or just limited space in general – this is not a worry. You will be able to fit this safe in almost any space you have available. The safe weighs 151 pounds. Not overly heavy, but also not an easy move. It comes with a mechanical combination lock and 2mm steel thickness. The interior is 8.7 cubic feet. A highly efficient use of space and big enough for the majority of home gun collections. 12 guns is a doable. Most people have less than this amount anyway. The Homak HS40221120 is currently approved by the California Department of Justice as a firearm safety device. This is always a very promising stat on a safe. When something is Government approved, you never have to worry about running into any kind of legal trouble. Homak has went ahead and provided a 5 year warranty. Ensuring your hard earned money does not go to waste if the safe ends up malfunctioning. Though there were very little reports of malfunctions. The instruction manual for the Homak HS40221120 wasn’t clear for customers without any experience of opening a combination lock. This was an issue about a year ago and should be fixed by now. In any case, they called customer support and received step by step verbal instructions on how to operate the lock. All things considered, this safe is considered tremendous value by many people who have bought it. The price is a big plus. To be able to get an approved, full size safe of this specification for less than $1000 is a great value. Homak’s personal customer service provided to people with lock errors is a huge bonus. Any problems you may run into will be quickly fixed. Everyone has horror stories of dealing with customer service – there won’t be any of that here. Pick up the Homak HS40221120 now. It will be one of the best fire arm related investments you will make in the next 20 years.